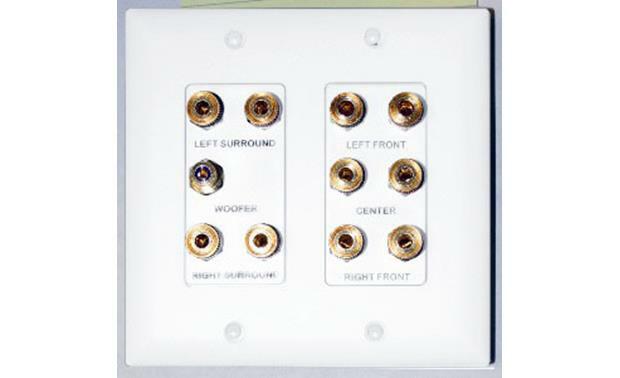 This panel gives you a convenient connection point for your home theater system's in-wall wiring. It installs in a standard dual-gang electrical box. I wanted a clean hook up port for the surround sound speakers in my outdoor bar, this was the best solution for the price Crutchfield was cheaper than a local store. Overview: The On-Q F9004-WH is a 5.1-channel home theater outlet strap for in-wall wiring. It includes two single-gang wall outlet straps that include 5 pairs of gold-plated binding posts and one female RCA jack. On the back, the binding posts have set-screw terminals that accept speaker wire up to 10 gauge. The RCA jack is backed with a female F-type connector. A Decora-style cover is not included. Configurations: Each strap fits into a single-gang outlet box. Additional single-gang straps are available for 6.1-channel or 7.1-channel home theater configurations. A 5.1-channel configuration can fit into a double-gang outlet box. With an additional strap, a 6.1-channel and 7.1-channel home theater configuration can fit into a triple-gang outlet box. Can the RCA jack be replaced with an F-type connector? The subwoofer RCA jack comes backed with a female F-type connector out of the box. However, none of the connections on the On-Q Home Theater Speaker Connection Strap are replaceable. If you would like to discuss further, feel free to contact an Advisor directly by phone (1-800-324-9695) or online chat. Searches related to the On-Q Home Theater Speaker Connection Strap (White) For 5.1-channel speaker setups.